David joined what was to become Squidjigger when he kept hearing that his eventual brother-in-law, Jesse, was seeking a guitarist for a Celtic trio. Fully expecting the venture to fail like most bands do, David jumped in with both feet and is so far the only Squid not to have missed a gig. Prior to asquidilation, David played in many bands ranging in format from 80s and 90s post-punk alternative, to 90s bar band and 21st century rock alternative. 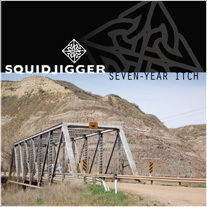 He has forgotten many keyboard, bass and banjo parts along the way, sticking mainly to guitar these days, and singing most of Squidjigger's repertoire – mainly because no one else wants to. You can contact him at david@squidjigger.ca.